Background Gene expression analysis of cells treated with extreme dilutions or micro amounts of drugs has been used to provide useful suggestions about biological responses. However, most of the previous studies were performed on medicines being prepared from a variety of herbal and metal sources. 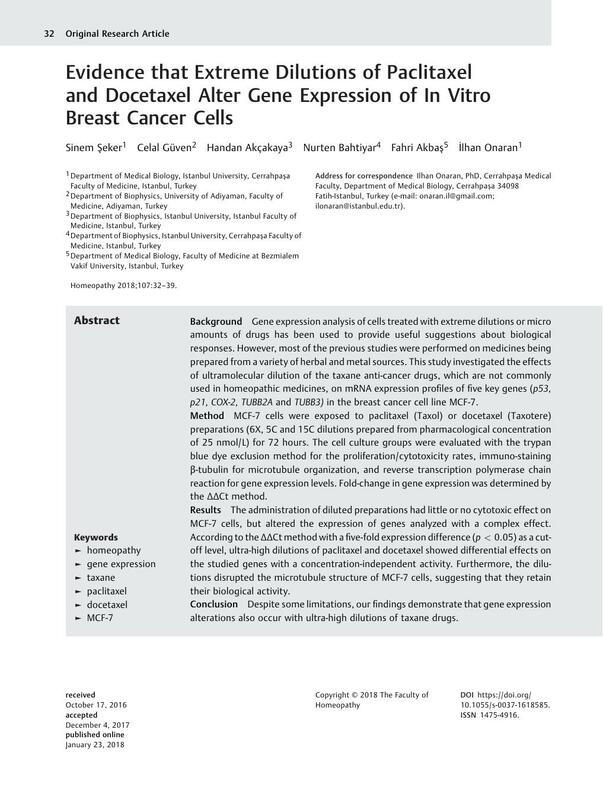 This study investigated the effects of ultramolecular dilution of the taxane anti-cancer drugs, which are not commonly used in homeopathic medicines, on mRNA expression profiles of five key genes (p53, p21, COX-2, TUBB2A and TUBB3) in the breast cancer cell line MCF-7. Method MCF-7 cells were exposed to paclitaxel (Taxol) or docetaxel (Taxotere) preparations (6X, 5C and 15C dilutions prepared from pharmacological concentration of 25 nmol/L) for 72 hours. The cell culture groups were evaluated with the trypan blue dye exclusion method for the proliferation/cytotoxicity rates, immuno-staining β-tubulin for microtubule organization, and reverse transcription polymerase chain reaction for gene expression levels.Fold-change in gene expression was determined by the ΔΔCt method. Results The administration of diluted preparations had little or no cytotoxic effect on MCF-7 cells, but altered the expression of genes analyzed with a complex effect. According to the ΔΔCt method with a five-fold expression difference (p < 0.05) as a cut-off level, ultra-high dilutions of paclitaxel and docetaxel showed differential effects on the studied genes with a concentration-independent activity. Furthermore, the dilutions disrupted the microtubule structure of MCF-7 cells, suggesting that they retain their biological activity. Conclusion Despite some limitations, our findings demonstrate that gene expression alterations also occur with ultra-high dilutions of taxane drugs.